• Design: The design of G230 is similar to that of G430. The only difference lies in the color of padding used. Unlike blue padding in G430, G230 has red padding plus it does not have software and USB adapter. • Comfort: This set of headphones is light in weight. Its swiveling ear cups fit the ears perfectly and do not exert any pressure over the ears. • Gaming performance: The quality of sound produced by G230 is good. The 40 mm neodymium drivers reproduce a clean sound. • Software: G230 does not work on any software. You may use the USB adapter that comes along with G430 to connect to your PC but don’t expect the features to stand out. Its features will perform only to a certain extent. You cannot demand it to match the standards of G430 because this set is just not meant to operate on any software. • Audio performance: G230 is certainly a good choice as it does not have a USB adapter to connect with. You can connect it directly to your computer’s jack which will give you an incredible auditory experience. • Microphone: Its noise cancellation microphone isolates background noise in order to give clarity to the sound generated by it. • Logitech G230 is very affordable. List price is $59.99 but usually you can get a discount under 50. • This set is very efficient in producing clean, loud and consistent sound. • It is very comfortable to wear. It won’t hurt your ears even if you wear it continuously for many hours. • It has got a good build quality. • G230 is designed with fewer features. Thus, it is less customizable. • The microphone of G230 is of average quality. 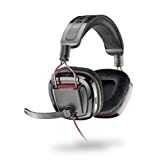 • G230 does not produce surround sound which is popularly a demand among avid gamers. • It does not have software so it lacks features and those extra edges that many high-end gaming provide. •List price is $79.99 but sometimes you can get a big discount under 50. • Design and Comfort: Plantronics GameCom is very light in weight. It has over-ear design and is built with very soft ear cushions that provide utmost comfort to the user even if used for long durations. • Compatibility: GameCom 780 works perfectly with computers and you can use it for any purpose may it be gaming, music, internet calls or any other. • Controls: Just in case you want to adjust volume while gaming, controls on ear pods will enable you in customizing it easily and very conveniently. • Audio performance: The audio quality of GameCom 780 is exceptionally incredible. This headset use Dolby and pro logic LLX technologies which is capable of converting sound of normal quality to an earth pounding 7.1 surround sound system. This technology will take your auditory experience to a whole new level. • Microphone: It is featured with noise cancellation ability which segregates background noise from the sound generated by the headset. • Cable: The length of the cable is 6.5 feet which is nearly 2 meters which helps the gamer in hassle free gaming. • GameCom 730 generates excellent sound with great range and amazing depth. • The conversion of standard sound to 7.1 surround sound is just the best thing one could ask for. The Dolby technology delivers absolute justice for the price. 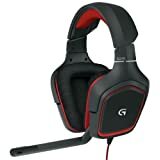 It certainly is best gaming headsets under 50 dollars. • Light and soft ear cups don’t bother the user at all. The headset is very comfortable to wear for multiple hours. • This headset’s build quality is pretty good and is very durable. • Plantronics GameCom does not have a USB adapter. • This headset is wired. This is certainly not a flaw but it could have been better if it was wireless. • The microphone cannot be swapped to the right side. It might create a bit hassle for lefties.